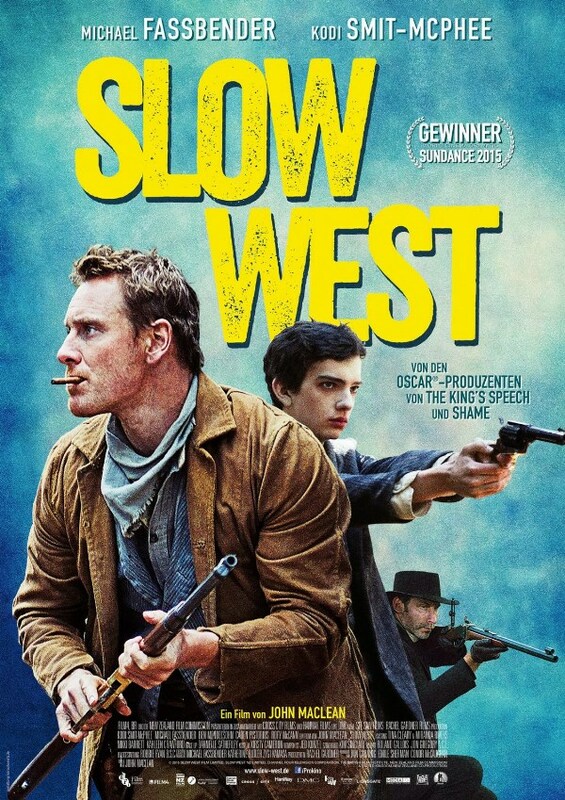 From the short description that I read online, I had high hopes for “Slow West” – which was shown as part of Vienna’s “Kino wie noch nie” open-air-cinema festival – hopes that, unfortunately, the movie ultimately met only partially. My reserved reaction, however, has nothing to do with the slow flow and the mostly quiet tone of the movie. That’s exactly what I was expecting, and I usually don’t have a problem with slowly moving films, thus I actually quite liked the slow buildup as well as the overall gloomy mood of the first hour or so. As for the landscapes… I’ve never been to Colorado, so I can’t testify about how much the locations in New Zealand captured here actually look like the region where the movie takes place. All I can say is that they looked absolutely gorgeous. As for the performances, I wish the movie would have done a little more with Michael Fassbender’s talents, but its undeniable that “Slow West” benefits from his charisma. Kodi Smit-McPhee is perfect for the role of baby-faced Jay, who is well-intentioned, but in way over his head. Ben Mendelsohn plays a serviceable, but also a little cardboard and unimpressive villain, and Caren Pistorius is a good choice for the charming young lady that Jay has cast an eye on. From the rest of the cast, however, it’s first and foremost Rory McCann who stands out, and who makes the best out of a role that, in less competent hands, could have been very forgettable. As for the reasons for my rather reserved reaction to “Slow West”, my main quarrel is with its tone. Balancing humor, drama and tension can be a tough act, and not everyone is a Quentin Tarantino (who seems to have this down like few others). Over the course of the movie, there were already a couple of scenes where I didn’t know if I should be shocked, or moved, or amused, and it all culminates in one of the most tone-deaf scenes that I have seen in recent memory (keyword: salt). I mean, that’s supposed to be the dramatic climax of the story, the moment the whole movie built up to, and it’s actually quite tragic – but in all this sadness, there’s suddenly this absurd, semi-amusing scene. I still can’t decide if that was intentionally or unintentionally funny, but either way, it’s not good, since either the scene doesn’t work like it was supposed so, or it was (in my very humble opinion) ill-advised. Maybe I just don’t get John Macleans particular sense of humor – that kind of thing happens. But for me, this scene didn’t work at all. Actually, the whole showdown was rather disappointing, as was the way “Slow West” ultimately ends. Thus, as nice as the buildup was, the finale ultimately lets the movie down, and hurts it considerably. As always, your mileage may very well wary, but I’m afraid that because of the disappointing finale and the uneven tone, I can’t really recommend joining Silas and Jay on their bumpy journey. This entry was posted in cinema 2015, movie reviews, new releases, Viennale and tagged Ben Mendelsohn, Caren Pistorius, John Maclean, Kodi Smit-McPhee, Michael Fassbender, Rory McCann, Slow West, western. Bookmark the permalink.